The port side of the rear lazarette houses the anchor rode box. This contains all the rode and chain for the rear anchor and part of the ready to deploy sea anchor plus all the dock lines "G". The Stbd side is mainly access to the steering quadrant however a massive bag of miscellaneous lines "H" is stored there held clear of the quadrant with a web of small lines. Also located here is the emergency tiller "C", spare mainsail batten "D" (Length of the longest to allow for cutting down) and mounted on the anchor rode box is the SSB Radio automatic tuner "E". 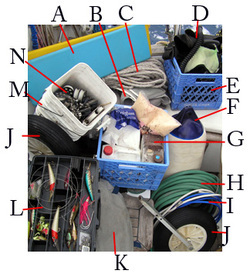 Also labeled are the exhaust hose "B" and the Bilge hose "A". The Stbd Lazarette is massive and holds all sorts of treasures. I have only photographed and detailed the items I will leave on the boat, we have much more we store in here as well! (G) Crate of resin, hardener, Micro Balloons and Glue Aditive. (L) Fishing tackle, only one side visible, small lures on the other side.